Bulgaria has an ancient and honoured tradition of wine making going back 6000 years to the Thracian tribes who once inhabited this land. Isn’t it time you tried the fruits of this labour? 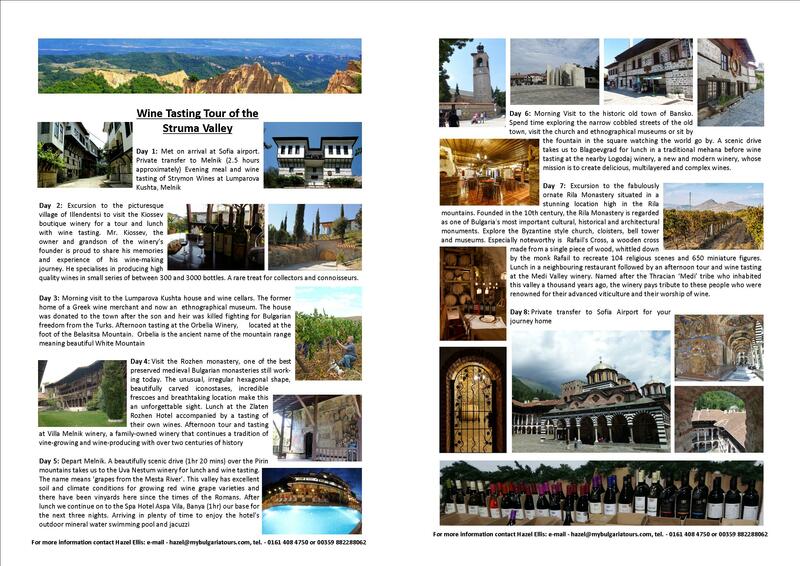 Our tour takes us to boutique wineries down the length of the Struma Valley in the south west of Bulgaria. This valley is noted for its very hot climate which produces the distinctive rich and fruity red wines for which this area, and Melnik in particularly, is famous. The Broad Leaved Melnik Vine is local grape variety developped specifically for this region. Allow yourself to be enchanted by the rich complex flavours of Winston Churchill’s favourite wine. Whilst this valley is mostly famed for its red wines, the Sandanski Misket is a white wine variety specifically designed to thrive in this area. Many of the local boutique wineries which we visit produce exceptionally good white wines, rose wines and in one instance ‘orange’ wine! Bulgaria’s smallest town and the capital of the most pre-eminent wine region in Bulgaria, Melnik is famous for both the quality of its red wines and the spectacular sandstone spires which surround it. Treat all your senses in this unique and captivating place! Contact me now for your personalised holiday itinerary!